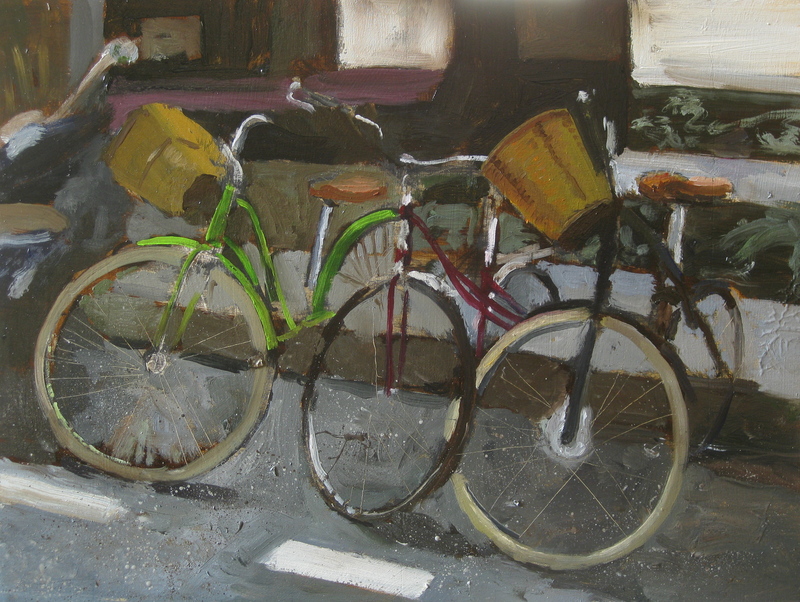 I found these bicycles just around the corner from where I live, near rue des Martyrs. This part of the ninth arrondissement has now become quite “bobo” – borgeois-bohemian. We have hipsters, high priced specialty food stores and an emerging clothing brand called “Pigalle”. Even the New York Times has done a number of stories on our neighborhood. And if the New York Times says something is cool, you know it must be so. So how did I come to live here, you might be asking? I give all credit to my wife, who has a way of finding very cool places to live, and always has. We moved here a little over two years ago. She’s always been ahead of the curve. Seriously, it is a great neighborhood, a real Parisian neighborhood. Nice markets, great restaurants, and not at all touristy. When I was about ten years old, my grandfather, on one of his many trips to Italy, brought me back a bicycle (he crossed on an ocean liner, in case you’re wondering how he checked in a bike). But it wasn’t just any bicycle. It had thin white tires! Not just the whitewalls. The entire tire was white. And not only that, but the bicycle had hand brakes, rather than the pedal brakes I was used to. Now, this bicycle caused me no end of grief. Not because I had trouble riding it, but because I was teased mercilessly by my friends. To us, a bicycle had thick black tires and pedal brakes. Pedal forward to speed up, backward to slow down and stop. My new bicycle, and by extension me, was not cool. You see, we did not yet know about the new “English Racing” bikes, with ten speeds, drop down handle-bars and hand operated caliper brakes. That would not happen for another several years. In the meantime, I couldn’t disappoint my grandfather. I rode my new Italian white tire bicycle with pride. I was ahead of the curve. Hello Josh, Thanks for your message, and congratulations to you and Carly! Paris is a great place for a honeymoon. Look forward to seeing you then. I’m glad you like the paintings….